On Sunday night, Team Canada’s figure skating power pair, Tessa Virtue and Scott Moir, skated their way to an Olympic gold with a rapturous performance to Moulin Rouge’s “El Tango De Roxanne.” In their heart-stopping routine, they dazzled audiences with an insane lift in which Virtue literally steps onto Moir’s quads with her blades, then just stands there, arms outstretched, like some glorious figurehead of a Spandex-clad ship. It’s just mind-boggling. It’s a legitimate question. The blades on figure skates are sharp enough to cut the skin on a person’s face and can even slice deeper, resulting in some serious injuries. But a closer look at the blade — and its positioning on the lifter’s leg — shows how it can be done safely. Here’s a version of the lift from a previous performance of the same routine at the Canadian National Skating Championships in Vancouver this January, in which the pair got a perfect score. Even with proper technique, this can’t be comfortable, but look at them beam! How do they do it? Part of the reason this can be done safely is because the blade of a figure skate is not like the blade of a knife or sword. If you look at a figure skate’s blade up close, you’ll notice that its cross-section is concave like the letter C, with its two arms making up the outer and inner edge that actually touch the ice. In the middle is the groove. Regular knife or sword blades have a thin, singular edge. Both edges of a concave figure skate blade are very sharp, but having two edges helps diffuse the weight of the wearer over a greater surface area, reducing the force on any one point on the leg. 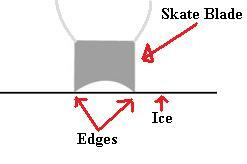 If skate blades were like knives, all of the wearer’s weight would be concentrated on a single, localized edge. When it comes to distributing force, two edges are better than one. When a force (in this case, Virtue’s weight) gets exerted perpendicularly on a surface (the blade’s twin edges, pressing into Moir’s thigh), the pressure is calculated by dividing the force by the surface area on which it rests. With the greater surface area supplied by two edges, the pressure is smaller than it would be if there was only a single blade. Whatever that pressure is in this situation, it’s not enough to cut through Moir’s uniform and flesh. That’s not the only factor skaters have to consider to do this safely. Another reason Moir is not bleeding out beneath Virtue’s blades is because they’re not moving on his thighs. Once she’s in place, she stays perfectly still. Doing so prevents the edges of the blades from sawing into him, the way you might use a knife to slice a tomato. Chefs and physicists alike know that using a saw-like slicing action with a blade seems to cut more efficiently, and in 2012 researchers at Harvard University discovered why. Pressing a wire against a gel and looking closely at the point of contact, they saw that cuts didn’t appear in the gel until the wire pushed down far enough to form the beginnings of a crack. But as the BBC put it, “the key difference between ‘chopping’ and slicing is that, in the former case the wire mostly just compresses the gel, whereas in the latter case the sideways movement of the wire also stretches it.” That stretching weakened the gel further, making slicing easier. In the paper, they explained that the extra stretching is caused by friction between the wire and the surface. Applying this principle to Moir and Virtue, any friction between her blade edges and his leg would initiate a cut faster than a motionless blade simply pressing downward. Again, their impeccable technique saves the day. The crazy lift starts around the 3:50 mark. Of course, just because physics can determine a safe way to do this move doesn’t mean most people should try it. Even serious skaters rarely do it. The Goose lift that has become virtually synonymous with Virtue and Moir has rarely been replicated by any other pair, so for the love of Roxanne, leave this power move to these two perfect, prolific professionals.